"I have unlocked StitchBuddy's trial limitation (saving a maximum of 1,000 stitches per design) by In-App purchase, but I haven't received any code and / or I still can't save larger designs…"
Once you've made the In-App purchase the trial limitation is instantly removed. There is no code sent, no registration email or any additional notification except the one from Apple that your purchase was processed. 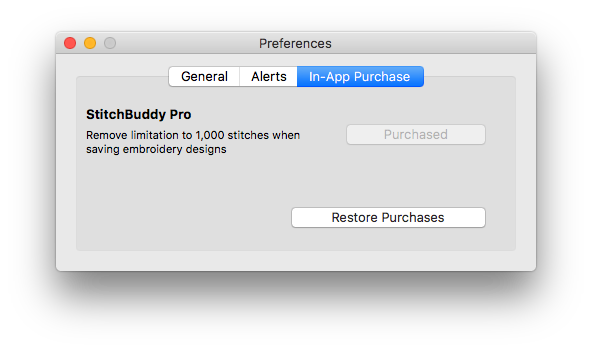 Please check if the purchase was correctly processed: When you enter the „StitchBuddy“ - „In-App Purchase“ menu item, is the button next to the „Pro“ feature reflecting a purchase by a title saying „Purchased“ and being disabled (grayed-out)? In this case the Pro feature is unlocked and your issue is related to another problem. Maybe your design is in PES format and exceeds 130 x 180 mm? StitchBuddy can only save PES files in version 1, with a maximum size of 5“ x 7“ aka 130 x 180 mm. There are maybe ways to bypass this limitation mentioned in this FAQ. Or you want to modify a design and the controls are disabled, which is caused by a missing selection as mentioned in this FAQ. If the Pro feature is not mentioned as „Purchased“ in the preference window, the easiest fix is to delete the app and download it again from Apple’s Mac App Store: You won’t be recharged and the new download will directly include the purchased functionality. It is not sufficient to just open StitchBuddy from the Mac App Store without deleting it first, so please make sure you have removed all copies from your Mac and the App Store is presenting a „Download“, not an „Open“ link. The last possible cause is that Apple has not processed your purchase for some reason. You can check this in your account’s order history in iTunes.